Successfully Added Music Lovers Edition MP4 Player 1GB - Super Audio Settings to your Shopping Cart. The black version of the popular Music Lovers MP4 Player. 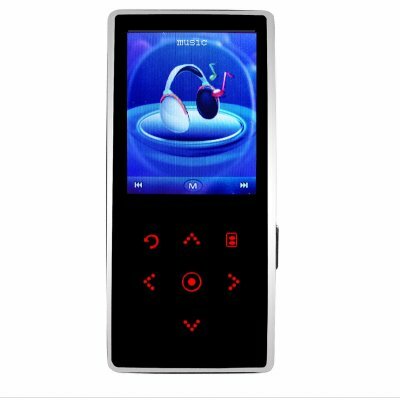 For all you PMP fans who demand superb quality sound from your music, and desire the ability to tweak music for the best possible results, then this new premium quality black 1GB Chinavasion Music Lovers Edition MP4 player is the Portable Media Player that you should be looking at. In addition to its impressive 2.0 Inch TFT LCD Screen, displaying highly rendered Digital Movies at 208x176 pixels, you get an impressive amount of video and audio file formats to play (see list below). Listening to your music is where this MP4 player shines. Adjustable SRS WOW settings will bring sound to life, whether it is through the built-in speaker or through the HQ ear buds. Don't worry about finding room for your files, as this PMP also has a mini SD slot letting you increase the memory an additional 4GB to make the total available an incredible 5GBs. Throw in the Touch Button interface with a Button Lock function, and you got a system that not only wows with its music, but just looks plain cool. Listen to music as it was meant to be listened to with this portable media player available to you exclusively through Chinavasion's online store. I bought this player to try Chinese products and I'm satisfied. Design is perfect, connection with PC is very easy and you can even play videos just like that. Menu is also nice, all I missed is the neck strap since the ear bud cable is short for me. Value for the money? > I'm giving 5 star for that, and 4 for accessories.